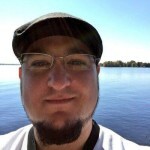 PK Sullivan is a writer and game designer living in Chicago. Originally from the northwoods of Wisconsin, his childhood was spent in Jedi training and pretending the Manhattan Clan were his friends. An abiding love of kung fu films manifested in his teenage years to round out his geeky interests. Aside from Star Wars, he enjoys genre fiction, cinema, and craft beer. PK came to Chicago for university and never quite left. He and his wife live on the northside and make plans for adopting corgi puppies. They make frequent trips back to the northwoods to visit his parents, who own and operate a lakeside bed & breakfast.